Having established South Asia’s largest and most modern LPG Transshipment Terminal at the Hambantota International Port, LAUGFS Chairman W.K.H. Wegapitiya presented its strategic advantages as an important LPG infrastructure in the Indian Ocean to serve the growing LPG demand in the region at the recently held South Asia LPG Summit 2019 in Dhaka, Bangladesh. The summit is one of the largest industry events for the LPG sector in Asia and attracted a large gathering of industry experts, investors, government representatives, policymakers, WLPGA top officials and other industry stakeholders. LAUGFS Gas, one of the largest LPG downstream distributors in Bangladesh, also took part in the annual event with Group Chairman Wegapitiya discussing how the LAUGFS Transshipment Terminal could be leveraged as a regional LPG hub to gain significant supply chain and cost advantages for LPG firms within the region. “The strategic opportunities our newest LAUGFS LPG Transshipment Terminal will create for the LPG industry within the region is tremendous. Set amidst key international maritime trading routes connecting the West to East and also located in close proximity to some of the largest emerging LPG markets in the region, the LAUGFS Terminal will not only cater to the captive demands of LAUGFS’s Sri Lankan and Bangladesh operations, but will also serve as a regional LPG Hub for other Asian LPG companies, serving as an important LPG infrastructure within the region to cater to its growing LPG demands,” explained Wegapitiya. With a 30,000 MT storage capacity, the LAUGFS LPG Transshipment Terminal will have a 1.1 million MT of annual handling capacity. It is strategically located at Sri Lanka’s Hambantota International Port, which is an all-weather port with a 19 m deep draft facility and the capability to accommodate Very Large Gas Carriers (VLGCs). This augurs well for the Terminal’s transshipment operations, yielding multiple supply chain benefits and cost advantages for the regional LPG industry. 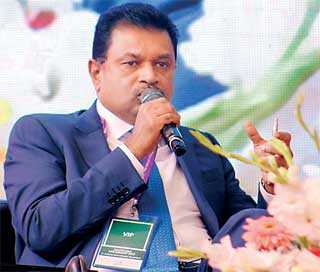 Stressing on the opportunities the new LPG terminal will yield for Bangladesh LPG Market, Wegapitiya remarked: “Bangladesh’s annual LPG consumption was less than 300,000MT few years back, and today it stands at one million MT. It is expected to touch four million MT in four to five years as per industry estimates. However, one of the largest constraints facing the Bangladesh LPG industry in terms of catering to this phenomenal growth in demand is the lack of required LPG infrastructure to support this growth trajectory. LAUGFS has made significant investments over the recent few years to harness regional growth opportunities through its integrated value chain expansions. The company continues to build its stakes in the LPG supply chain to position itself as an integrated LPG player in midstream and downstream sectors within the region. The LAUGFS LPG Transshipment Terminal at the Hambantota International Port is one such important investment to help create an LPG Hub within the Indian Ocean Rim area. Its operations will be supported by LAUGFS’s other businesses within the LPG value chain, such as LAUGFS Maritime, which owns and manages its own fleet of LPG ships providing maritime LPG logistics support for the region, as well as SLOGAL Energy DMCC, which engages in energy trading based in Dubai, UAE. LAUGFS Gas has a strong footprint in the Sri Lankan LPG downstream industry since its entry into the market in 2001. As part of its rapid expansion plans as one of the largest LPG integrated players in the region, LAUGFS has also made significant investments in its Bangladesh LPG downstream operations since its entry into the Bangladesh market in 2015. Last year it commissioned a state-of-the-art new cylinder requalification facility, while its current ongoing investments include the expansion of storage capacity, the addition of a new carousal to increase bottling capacity as well as expansion of its distribution network.